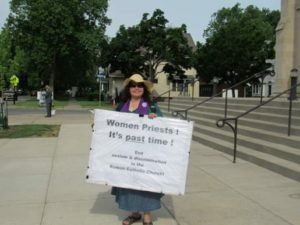 Yesterday, I protested the exclusion of women from the RC priesthood at the Cathedral here in Rochester. It was an interesting day as always. Unlike last week, the Bishop made sure to bless me this time (or exorcise me ￼). The main doors to the Cathedral are made of wood with glass panels and the clergy line up along these doors. When the procession starts we protesters stand facing the doors with our signs making it easy for clergy to see our signs as they are on the move. Today I stood alone in front of the back door. It’s surprising how many of the clergy wave in support. The Bishop, who is always the last to process in, made a deliberate stop to let me know he saw me, then blessed me. I didn’t respond at first but he kept on doing it, so I reciprocated. Strange! Unlike last week, when it was over, photos were not taken on the outside front steps of the Church. I heard that one of the reasons for this was that the Bishop didn’t want the focus to be on me. Apparently my photo appeared in some article. 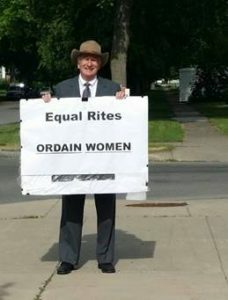 A nice elderly priest came prepared this time with a response to us. 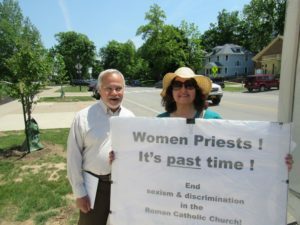 He handed me an index card with the following statement: “Jesus Christ did not exclude women from the Roman Catholic priesthood. He exempted them from the Priesthood. Mary is the creature of God the Father and the Mother of God the Son and The Spouse of the Holy Spirit. She is the Mother of all priests. (and he signed his name). Sigh. A young seminarian from the archdiocese of NYC (ordination in 2 years to priesthood) approached me at the end and we had a long conversation. Of course we agreed to disagree and shook hands before we parted ways and asked each other’s name . 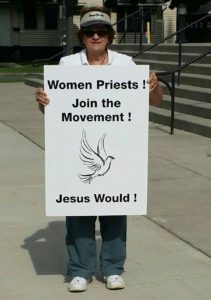 One of the things he said to me was that he didn’t know any or of any women who wanted to be priests. Sigh. Are they all this naive or uninformed??? Still it was good to have this conversation. I managed to get in Fr. Tony Flannery’s take on the matter: “The argument that a woman cannot be a minister because she cannot be ‘in persona Christi’ is such a ridiculous argument…that belongs to the time of the flat earth, when Galileo was persecuted.” (I paraphrased.) A very elderly priest told me you either believe the Holy Father or you don’t. I said the Pope is human and he cut me off and said, so you see, you don’t believe and he walked off. Two Hispanic priests were outside for a bit checking their cell phone and going over the program. One of them was very friendly and waved hello. I asked a bit later if he wanted to take my picture and he said yes. I like pictures of my sign because I hope they reach others. Always good to see people we know and who support our cause (that includes clergy). A friend of Spiritus Christi and frequent visitor with his wife, Fran Cardella, was there to support one of the young deacons in his parish who was being ordained a priest. He’s very supportive of our cause and took some of the photos displayed here. He’s pictured with me in one of the pics. I thought it was nice of the usher to come out and ask if I wanted water… it was a hot day. Both he and security staff were very nice to us this weekend and last. I received about 5 mean or insensitive remarks.. all from women. But we also got a lot of words and gestures of support from women, too. Two of the not-so-nice comments came from two women who, along with others, arrived at the event via shuttle. Good or bad, it’s great when you can help create awareness in people from out of town. Thank you, Judy K. and Jim H. for being there today. And way to go our friends in Buffalo and Syracuse for doing their own witness at local ordinations last weekend and this weekend. Western NY CTA members gathered for an Ordination March on Saturday, June 6, in front of the Cathedral as three priests were ordained. 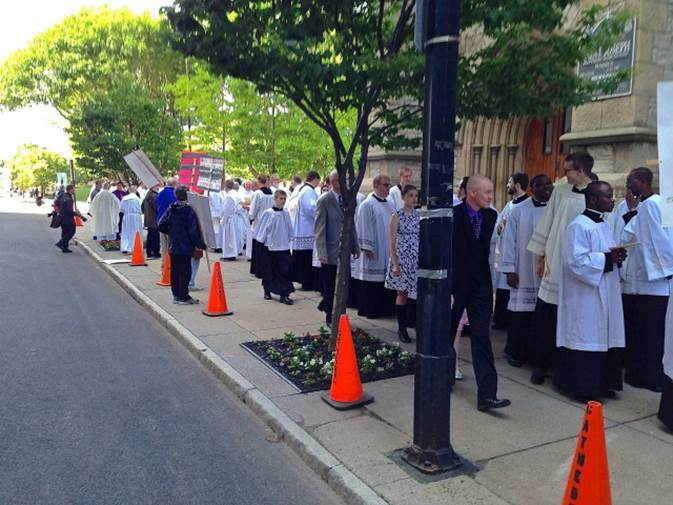 We had eight of us marching outside St. Joseph’s Cathedral in downtown Buffalo on Saturday morning, prior to the ordination Mass. We greeted all comers pleasantly and had a wide gamut of responses – many encouraging remarks, high five’s and thumbs up, but also some negative comments, either saying WO will never happen, or calling us disgraceful, etc. Overall, I’d say more positive than negative. The fact that one of the ordinands is from Africa produced the most puzzling negative when one woman told us that we were only doing this because a black person was being ordained…. I’m prepared for disagreements with our cause on many fronts – but this one left me very puzzled. The full entrance procession passed by all of us on the way into the Cathedral. At least one us reported receiving a “Good Morning” from the bishop. Here’s a link to the story that was in the City section of today’s Buffalo News. In the print edition there is a picture of Lucille carrying some of our signs. 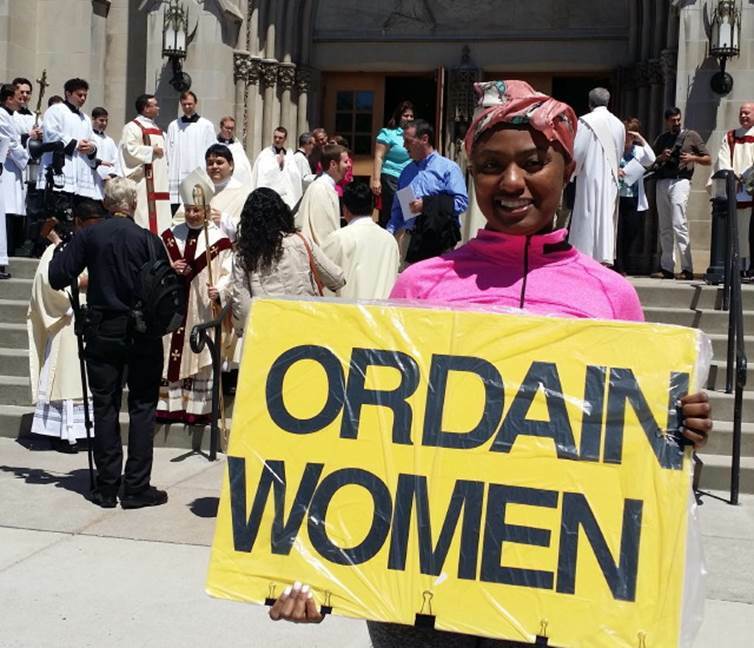 On the same day the Rochester Ordain Women Movement (ROWM) provided a Witness for Women’s Ordination outside the Cathedral in Rochester as Deacons were ordained. Bishop Salvatore Matano and retired Bishop Matthew Clark presided at the Diaconate ordination this morning. We were there before Mass and after Mass. I tried photo bombing a photo being taken of the two bishops and four new deacons but was quickly escorted off the steps to the public sidewalk. It created a little excitement. I exchanged greetings and hugs with quite a few familiar faces ….priests, nuns, deacons, friends who were supportive of us and met some new faces who expressed their thanks for our being there. We received lots of positives but also some anger and some “in your face” from two women (sad to say). We were called unchristian, no class, go to another church, ruining the day for the deacons,….the usual stuff. After mass a young woman from the neighborhood joined me. It was great to have a young person there. 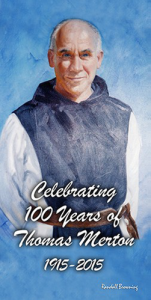 Save the date: June 20 for a priest ordination.